As part of our ongoing ESRC research project, exploring the impacts of the behavioural sciences on public policy, we have just completed a mindfulness based behaviour change intervention with 15 members of the Welsh civil service. The Mindfulness, Behaviour Change and Engagement in Public Policy course ran for 8 weeks and sought to combine Mindfulness training and practice with discussion of the emerging insights of the behavioural sciences into the nature of human behaviour. The course was led by Rachel Lilley who is both a Mindfulness teacher and behaviour change practitioner. This course had two goals. First, we were interested in the extent to which it was possible to combine a standard 8-week Mindfulness course with reflections on behaviour change thinking. Second, we were keen to explore whether mindfulness could provide a more empowering context within which to deliver behaviour change measures. We are evaluating the course using both quantitative and qualitative measures and hope to have the final results soon. The initial feedback on the course has, however, being very positive, and there are plans to make it more widely available. In relationship to our two goals, it appears that it may be possible to deliver an appropriately designed Mindfulness based course that can incorporate discussion and learning about behaviour change ideas. In this context, it appears that Mindfulness provides a really useful practical context within which people can become more aware of the impacts of both cognitive activity and embodied emotions on their decisions and actions. It also appears that mindfulness could offer a way of empowering people to better understand and change their actions than the more covert strategies embodied in nudge-type techniques. Despite its emerging popularity, we are aware of the fact that Mindfulness can all too quickly be seen as a solution to all sorts of socio-economic issues and be part of a wider “therapy culture”. We do, however, agree with Jonathan Rowson when he argues that we should be cautiously optimistic about the broader ways in which Mindfulness can contribute to social wellbeing in therapeutic and non-therapeutic contexts. It was in this context that we were most encouraged by a recent meeting we had with Chris Cullen and Chris Ruane MP. Chris Cullen and Chris Ruane have been instrumental in providing Mindfulness training for Members of Parliament and in establishing the All Party Parliamentary Group (APPG) on Mindfulness. The Mindfulness APPG is supported by the Mindfulness Initiative—‘a coalition of Oxford, Exeter and Bangor Universities [formed] to advocate for a better understanding of mindfulness as a low cost intervention and its potential in a range of public services’. We firmly support the purpose and intention and the APPG and Mindfulness Initiative and hope that in some small way our own work can contribute to a better understanding of the wide range of policy implications that Mindfulness has. Rachel Lilley and Mark Whitehead with Mark Williams MP. 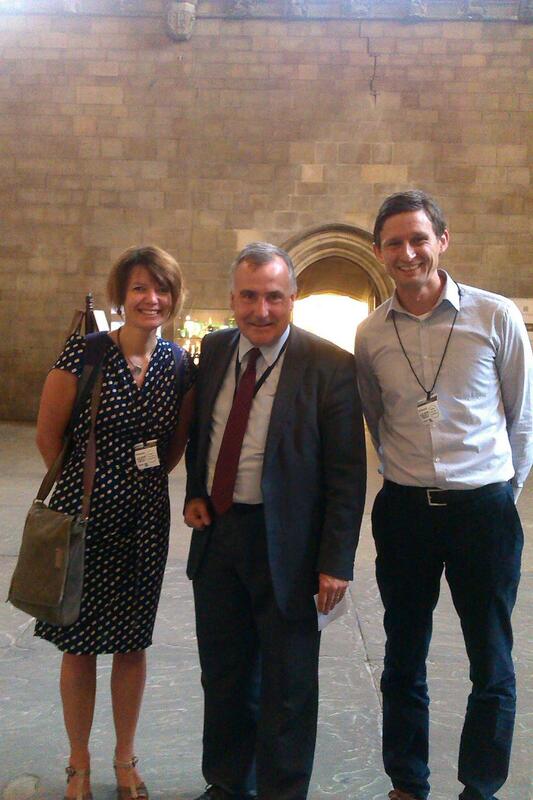 Mark Williams kindly facilitated our meeting wth members of the Mindfulness APPG.